In 2012 I was in Georgia, with a Swedish Defence agency on a joint UN and Nato/PfP disaster assessment (EADRCC) exercise. 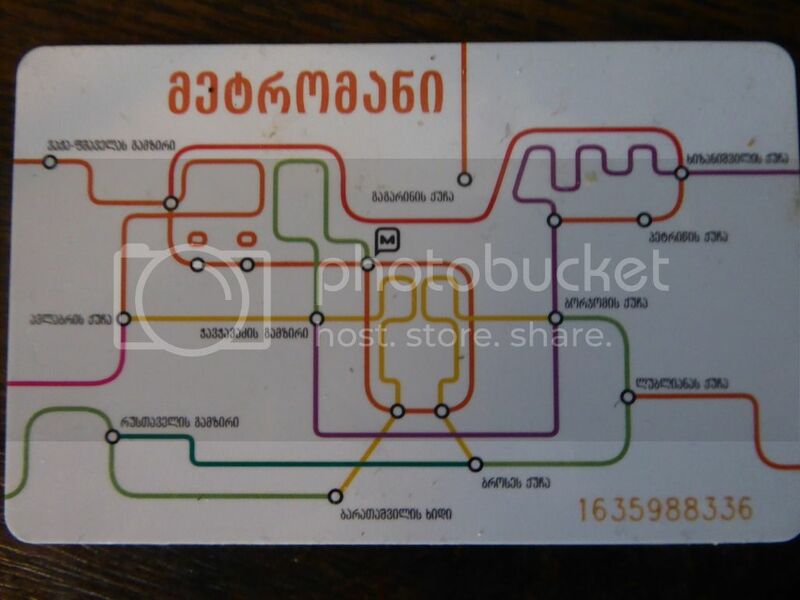 Here's a photo I took of my universal Tbilisi transport card, of interest is that it has the Metro map printed on one side. How clever is that? London Underground map on the Oyster card, anyone? Also, notice how the yellow line in the middle looks a bit like a tube from the front, and on some yellow tracks. Tbilisi also has a cable car that takes you from the new parliament and new opera square up to the top of the hill where the amazing churches are. Going up is one thing. But coming down,man alive! When it leaves that platform, you think you're going to drop as there's is a definite drop of a couple of metres as the cable goes slack.